R&B lovers get ready for the return of one of the greats. That’s right, it’s Lauryn Hill, making a hotly awaited comeback in the celebration of the 20th anniversary of her album “The Miseducation of Lauryn Hill” at the Veterans United Home Loans Amphitheater on Thursday 5th July 2018!! Tickets are expected to fly for this, so get in there and grab yours while you still have the chance!! With sales of 422,624 in its first week at No.1 on the Billboard chart, “The Miseducation of Lauryn Hill,” Lauryn Hill’s first and only solo studio album, broke the record for number of sales in the first week by a female artist. 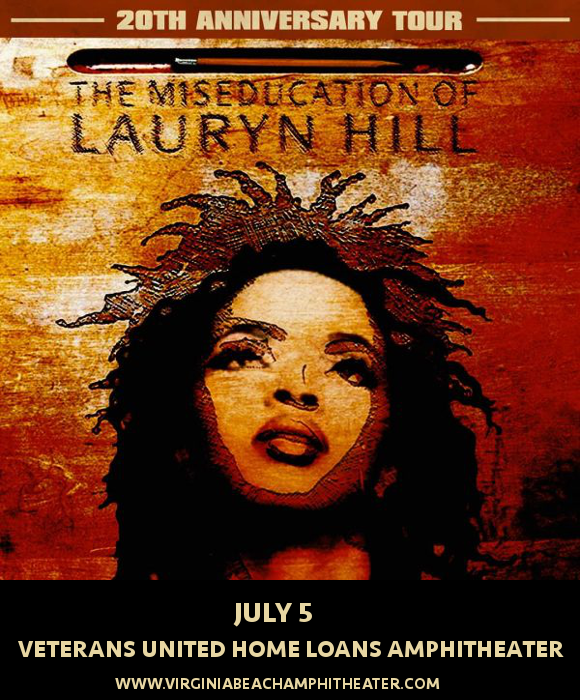 Described by Entertainment Weekly as "an album of often-astonishing power, strength, and feeling", with Lauryn Hill "easily flowing from singing to rapping, evoking the past while forging a future of her own,” the album received overwhelmingly positive reviews from critics across the board, and won no less than five Grammy awards, including Best New Artist and Album Of The Year. Today, the album remains a culturally important one, helping to establish neo soul as a genre, and sine its release has been ranked in countless best-album lists, with critics regarding it as one of the best albums of the 90s and even of all time!! After samples from the hit song "Ex-Factor" were recently used by Drake in “Nice For What” and Cardi B in “Be Careful,” fans foresaw the return of Lauryn Hill herself. Now, here she is – so get your tickets before someone else does! !